Pastor Arlen Payne was born in Anadarko, Oklahoma. As a young child he moved with his family to Wichita, Kansas. He graduated from Wichita High School South and the Wichita Area Vocational-Technical School in 1971. Having received Christ at the age of 8, he attended church regularly most of his childhood. During the summer before his senior year in high school he surrendered to the call of God on his life at First Bible Baptist Church in Wichita. Rev. Doyle Hopper was the Pastor at that time. In the fall of 1971, Pastor Payne enrolled at Baptist Bible College in Springfield, MO. It was while attending Bible College that he met and married Lana Sue Rector. 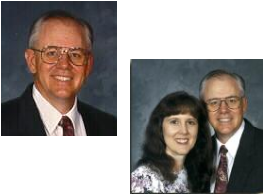 They graduated together from Baptist Bible College in the spring of 1974. After serving in Oklahoma and Georgia, Pastor Payne and his family moved to Hollywood, Florida where they worked in the school ministry of First Baptist Church of West Hollywood under Rev. Verle Ackerman and later Rev. Bud McCord. Pastor Payne also worked in many areas of the church including, Sunday School, Singles ministry, Children’s ministries, and managing the church bookstore. In the spring of 1990, was asked to come and preach at the “Chickee Church” at the Hollywood Seminole Indian Reservation. By the end of the summer the church had called him to become their Pastor. After working full time at First Baptist Church for nearly two years and trying to perform his duties as the Pastor of the church, he and his wife were approved to be missionaries to the Seminole Tribe of Florida through the Baptist Bible Fellowship International. Under his leadership and the grace of God the church has grown, and a new building was built. In the spring of 2005, Bro. Payne resigned as the Pastor of Chickee Baptist Church and moved to the Big Cypress Seminole Reservation where he assumed the pastorate of Big Cypress New Testament Baptist Church. Pastor Payne enjoys Bluegrass Gospel music and fishing for bass in the Everglades.